As Tunisia concludes its final deliberations on the new constitution, transitional justice issues such as reparations for victims, truth about the past and the rights of women have been central to the legislative debates. Activists continue to demand that the proposed transitional justice law and potential truth commission respond to victims’ needs and ensure their participation. Over the past month, ICTJ’s leading experts have been engaged with stakeholders on the ground on a variety of issues under deliberation, including truth-seeking, reparations, gender justice, and the role of children and youth in the process of reckoning with the past. During a debate of the Tunisian Parliament on the proposed transitional justice bill, Director of ICTJ’s Truth and Memory program Eduardo Gonzalez advocated for victims’ right to truth and justice. “Knowing the truth about the past is part of justice, not an alternative to prosecutions,” said Gonzalez. He stressed that any potential truth commission should be victim-centered, with a mandate to investigate key patterns of human rights violations that may have occurred under previous regimes included within the proposed timeframe of the commission. Any truth commission should be spared any other purpose that would distract it from this focus, such as the proposed idea to attach it to an “arbitration committee” charged with resolving corruption cases out of court. Gonzalez said that there is no reason to exclude the youth from participating in the proceedings of the truth commission and that the proposed bill falls short of gender parity. As the legislative process gathered pace, ICTJ was invited to provide a series of trainings and workshops for government officials, and civil society activists including members of victims’ groups and women’s organizations. At a two-day workshop with the Ministry of Women, Family Affairs, and Children, as well as the Ministry of Human Rights and Transitional Justice, ICTJ experts presented transitional justice strategies to address gender-based violence and encourage participation from women and youth. In her comments on the proposed truth commission, Director of ICTJ’s Gender Justice Program Kelli Muddell advocated for transparency in selecting commissioners and ensuring that they are experts on gender justice issues. At the event, ICTJ experts led discussions with key members of Tunisia’s ministries on how to develop strategies for victim participation. Virginie Ladisch, Head of ICTJ’s Children and Youth program, spoke to the unique importance—and challenges— of including young members of Tunisian society in transitional justice processes, and advised the Ministry to take proactive steps to ensure their participation. Ladisch encouraged the Ministries to establish connections with the education sector to facilitate outreach to children and have a platform to discuss key findings of the transitional justice process with students across the country. 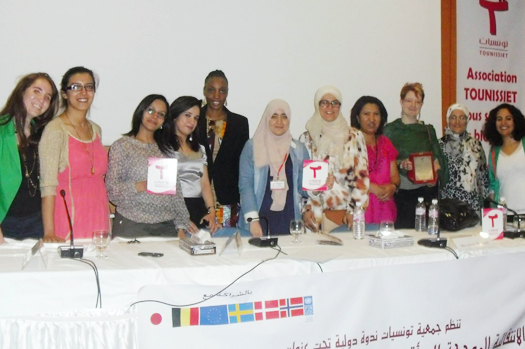 Women’s participation and issues of gender were the focus of a second two-day conference, organized by the women’s association Tounissiet, this time approached from a regional and international perspective. Pointing to unfolding dynamics in the MENA region, ICTJ’s Deputy Director of the Middle East and North Africa program Anne Massagee talked about the role of women in the transitional justice process in the various “Arab Spring” countries. In the same session, ICTJ’s Program Associate Salwa El-Gantri focused on women and transitional justice in Egypt, underscoring their role of women as leaders and right holders. Leading a discussion on lessons from other international contexts relevant for Tunisia’s own moment of transition, ICTJ’s Ruben Carranza, Director of the Reparative Justice program, discussed the intersection of gender justice and reparations, drawing from experiences of the Philippines, Nepal, Indonesia, and Timor-Leste. ICTJ conducted two more trainings on transitional justice and gender justice for civil society groups in Tunis and Monastir. Both sessions covered issues such as the human rights abuses caused by the prohibition against wearing the veil, the difficulty of truth-seeking with highly stigmatized sexual violence victims, and the disadvantages faced by women whose husbands had been imprisoned under the Ben Ali regime. At a forum and workshop on the private sector’s role in Tunisia’s transition, Reparative Justice program director Ruben Carranza addressed victims’ groups, members of the Tunisian business sector and members of civil. Civil society groups openly named ways that businesspeople complied with the Ben Ali regime, from not speaking out against the dictatorship to profiting from his repression. At a meeting on reparations policy with National Constituent Assembly members, Carranza emphasized that victims have a right to reparations, regardless of religious or political affiliation, yet the most vulnerable – taking into account gender, age, and material need – may be prioritized. Reparations, usually meant for individuals, may also be delivered to communities or groups to reflect experience of such victims, he said. ICTJ has been working extensively with government and civil society actors in Tunisia as part of its cooperation agreement with the Tunisian government. Signed in January 2013, the agreement outlined ongoing and future cooperation between ICTJ and the Tunisian government in an effort to promote transitional justice in the country.